A magician, his magic top hat and his desperately cute and hungry rabbit. PRESTO is a Pixar featurette before WALL-E and has brought back the classically hilarious “short,” popularized by Warner Bros. and Bugs Bunny cartoons all those decades ago. Presto the Magician is onstage for his act, but his rabbit wants to be fed, so refuses to be pulled from Presto’s magic hat until he gets his fix of carrot. 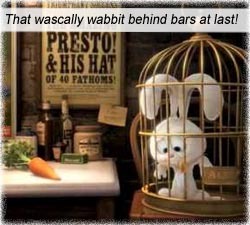 The myriad ways in which he confounds Presto’s attempts to drag him from the hat are – once again, when speaking of Pixar – absolutely ingenious. The protagonist, being a rabbit, made me realize how a person from the 40s or 50s might have felt when that other cheeky rabbit careened across the silver screen for the first time, with that sense of amazement and wonder at watching something so guttingly funny. Doug Sweetland directs and voices both Presto and the bunny Alec (with merely grunts and rubber ducky noises, no actual dialogue), and writers Ted Mathot, Valerie LaPointe and Justin Wright give us gag after gag of Bugs-inspired mayhem. Watch for the last frame, where the reveal of the bunny’s full name is yet another crackup gag and a perfect stinger to the cartoon. aka: PRESTO AND THE MAGIC HAT. Writers: Ted Mathot, Valerie LaPointe, Justin Wright.